One of the key components to the IB Psychology course is the internal assessment project. It is a simple experimental study which aims to replicate a Psychology experiment. Every IB Psychology students is required to plan and undertake a simple experimental study and to produce a report of their study. A simple experimental study involves the manipulation, by the student, of a single independent variable and the measurement of the effect of this independent variable on a dependent variable, while controlling other variables. Teachers should prepare students for the simple experimental study and the writing of the report. The IA is such an important component of the IB Psychology course and forms such a large part of the student's overall grade that the teacher must have a very good idea of what he or she is doing. A good IA will save you from failing the IB Psychology course and a great IA will help to achieve maximum success. 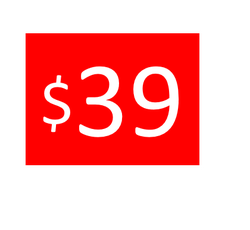 It is not easy to get a near per mark in your IA. 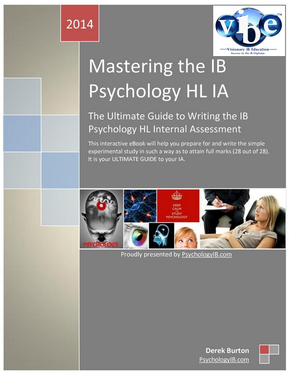 However, with this Ultimate Guide to the IB Psychology HL IA you should be that much closer to achieving full marks. The simple experiment is marked by your teacher and moderated externally (sent away to an IB examiner to ensure that you get the mark you actually deserve). The mark for this piece of work makes up 25% of the standard level final grade and 20% of the higher level final grade. It is up to you to plan and carry out this research, and there is a wide variety of possible experiments for you to engage in. The main purpose of the Ultimate Guide to the HL IA is to help you choose, conduct and write up an appropriate study to earn great marks. 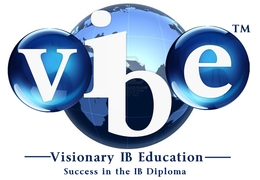 Getting a great mark on your IB Psychology IA is the single most important thing you can do to achieve IB Psychology success. If you are an SL IB Psychology student, you should replicate a study that has already been done. Well known and simple experiments are usually much easier to deal with. If you are an HL student, you need to do the same thing but you need to find more detail about the background to your study. And you have the freedom to make modifications to it. many appropriate experiments come from the field of cognitive psychology, and you can find descriptions of these in the Ultimate Guide to the IB Psychology HL IA. The Ultimate Guide to Writing the IB Psychology Internal Assessment. This interactive digital book provides you with all the help you need to master the higher level IA and achieve maximum marks (28 out of 28). Having a great IA is the best way of ensuring that you will achieve a great overall total grade in IB Psychology HL - this is worth 20 per cent of your final grade. The HL Internal Assessment is a report of a simple experimental study. The student replicates a study and writes a report on that experiment. It is worth a very substantial 20% of your final IB Psychology grade. If you perform poorly in the IA, you will lose an overall mark in the grade boundary calculations – knocking your 7 back to a 6, or your 4 to a 3. Without help, it takes time and effort to research, prepare and write it up properly. You also need an experienced IB Psychology teacher who really knows what he or she is doing here to be able to guide you towards maximum marks. 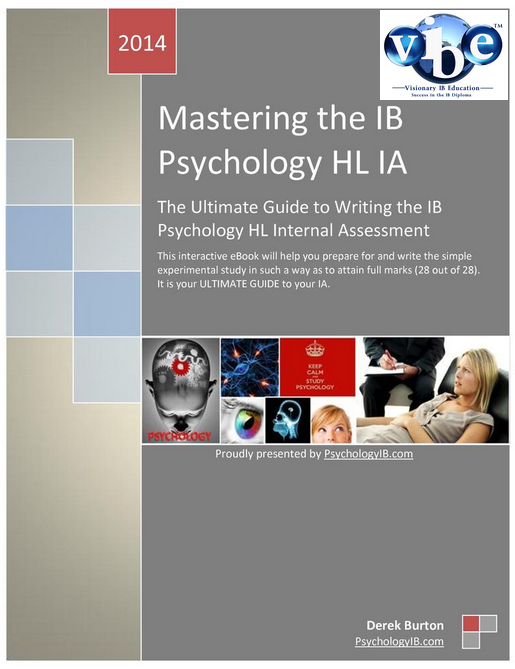 The Ultimate Guide to the HL IA runs you through the whole IB Psychology IA in a step-by-step process. It is the most effective IA Psychology guide available today, and it will give you the best chance of achieving maximum possible marks in the least time. It is not a simple PDF, but a complete interactive digital book with video tutorials, links to statistical calculators, downloadable files (eg., Informed Consent and Debriefing documents) and lots of embedded examples of exactly what you need to be writing in each section to obtain the maximum marks. "This is worth it just for the statistical and results sections alone! A truly useful guide." - Amelia Hearst, third year IB Psychology teacher.